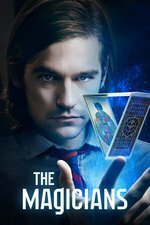 Den of Geek - The Magicians goes all in on the Library’s fascist control of magic while it liberates and dethrones others in an insightful episode. I really like Brittany Curran / Fen and Mageina Tovah / Zelda! I fully support their more prominent roles this season. I do, however, object to the relative lack of Eliot which is completely unacceptable. And what is odd in most of the promotional images Eliot is the main image. Perhaps it was written with a lot of evil god Eliot doing nasty stuff that got left on the cutting room floor? Speaking for myself, I think we get plenty of Monster!Eliot doing awful things - he kills someone nearly every episode - and prefer the purely weird stuff, like him walking over the couch as opposed to around it, since it was a straighter path. I am a little mystified why he never seems to help with his own research, but I guess he just finds it too boring? Ok, since they obviously want to make it a plot twist... what is "so much worse" than re-incarnating the Monster? what is "so much worse" than re-incarnating the Monster? Building a completely different, second monster? Perhaps a Mrs. Monster for the Monster to have a bunch of Monster-kids with? Season Five: Miserable Mean Magical Manic Monster-kids. Ice Axes! I had given up hope that we'd ever see Margo/Janet wield the ice axes. (One of her most badass things from the books). Monster Eliot's couch climb had to be rewound a couple times. I like the development for Zelda, Margo, and Alice (though gods, what a terrible wardrobe on that woman). It makes total sense that Margo would give up the throne to save Eliot. I definitely squeed when I realized where they were sending Margo/Janet. I might still be squeeing. A week later, and I'm still all emotional about Margo's goodbyes to Fen and Josh. Apparently Sera Gamble's been hoping that Margo would get to the desert since Summer Bishil first auditioned (Instagram).